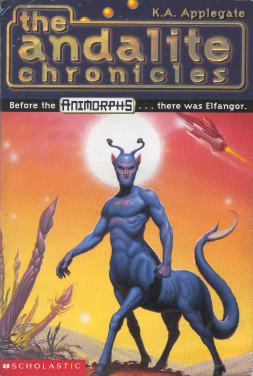 At the beginning of the Animorphs series, the Andalite Prince Elfangor crashes his ship on earth, and before he dies gives five children the power to morph, so that they can fight to defend their planet against the invading Yeerks. The Andalite Chronicles is Elfangor's story, his hirac delest (final statement), transferred from his mind to his computer in his final moments. It's interesting to see Elfangor, looked up to by Ax and the other Animorphs as a hero, when he was just an aristh (a cadet). Aside from this backstory, this book gives us a bunch of other context for the main series: we get to learn more about the Taxxons, more about how the Yeerk who would become Visser Three managed to take over an Andalite host, as well as a rather mind-blowing fact about one of the main characters that I can't say any more about without a big spoiler. The Andalite Chronicles isn't part of the chronology of the main series, meaning you could read the series without reading this book, but you should definitely read it. It's well-written and action-packed, and who doesn't love a tonne of back story?